The passage from Hilo to Honolulu was rough. It made all the adults seasick, while all the kids were as fit as ever. The picked up to over 40 kts while crossing the channels between the islands which allowed us to sail at a pleasant speed with merely half of the fock out. Exhausted but feeling better we arrived in Ala Wai Harbor where we had the pleasure of welcoming Theres Desai, the Swiss Honorary Consul, on Pachamama. She has been a great help since we arrived! Through her we got to meet Ueli Krauer, the General Manager of the five star Hotel Halekulani, here in Honolulu. He is generously letting us stay in the Hotel for a week! Tuesday we also had the chance to meet Nikolai Maximenko and Jan Hafner from the International Pacific Research Center to show them the data we collected sailing from Panama and further options of collecting data on the way to Alaska. 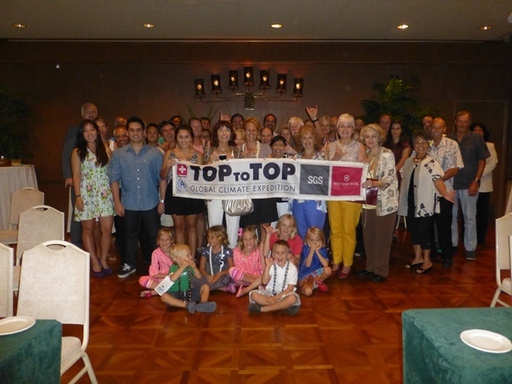 Yesterday, ToptoTop held a press conference followed by a presentation in the Hotel Halekulani. 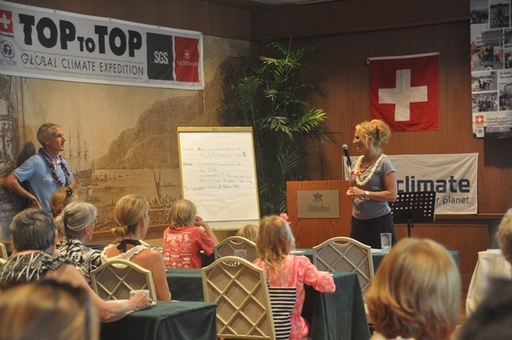 The audience had the chance to hear about the expedition from Dario and Christina. 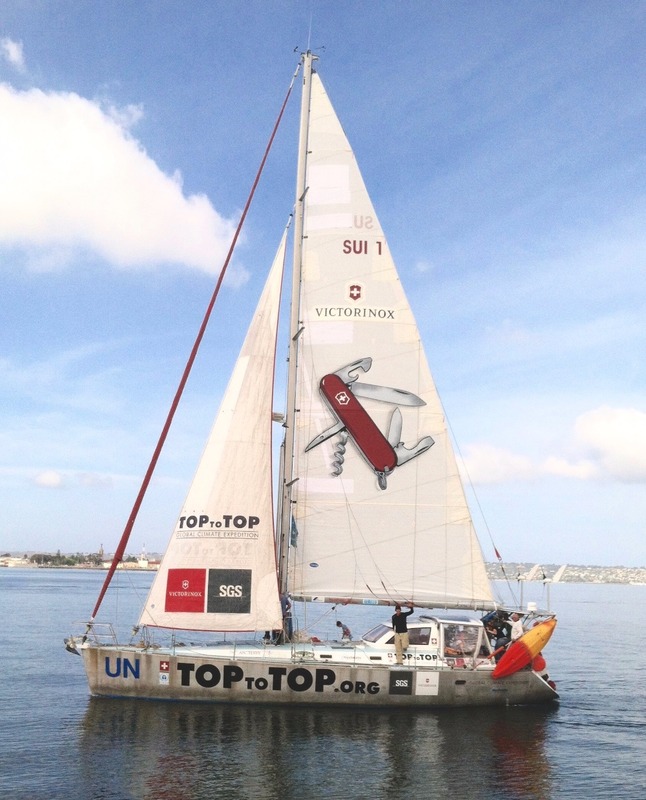 Halekulani will be the basecamp for the loop in the North Pacific and the location where the first water sample for the data ToptoTop is collecting for the IPRC, will be taken. 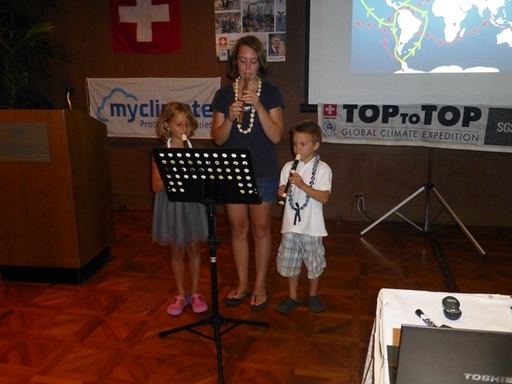 Then Salina and Andri had their first public recorder performance, they did a great job! Meret is leaving us today after nearly half a year on Pachamama. She became a very good friend to us and specially to our children. We hope she has a good start with her environmental studies in Britain and we are all looking forward to see her back soon. Again BRAVO and MANY THANKS! Meret, she is leaving today after 5 months with toptotop. Everyone have become fond of her and so the goodbye was hard. I (Nicole) arrived yesterday evening from switzerland. But there is no time to relaxe, the next morning we hiked the Kuliouou Ridge Trail in eastern Oahudo. At the end of Kuliouou valley we started our morning footing. 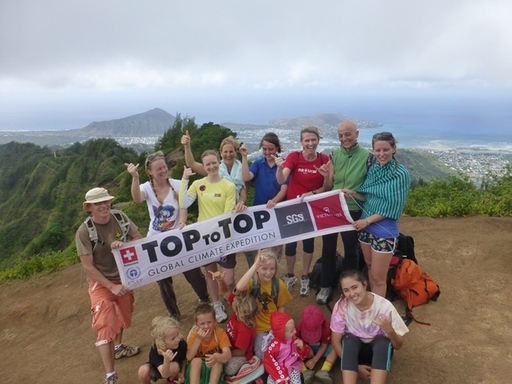 After one hour through the forest, climbing steps and 10 liters sweated, we got rewarded by a beautiful view over waikiki, diamond head and the kahala beach. Dario, Andri, Erwin and I climbed a bit higher up the ridge but the fog had blocked a greater view. The children did a race downwards because there was not a lot of plastic to collect. 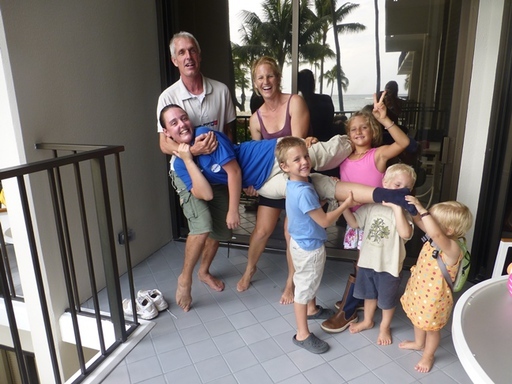 – between 7:15 and 7:30am at the Halekulani Hotel, front entrance; we will drive off at 7:30, and you can follow us in your car; if you have space in your car to take extra passengers, please let us know! – at 7:50 am at the trail head in Kuliouou valley. Please see the link above for driving directions. Note that there is no official parking lot. You will need to park along the street at the end of the residential area where the trail head is located. At this early time in the morning, this will hopefully not be too difficult. The hike is about 2 miles each way, with quite a bit of elevation involved (but rewarded with stunning views from the top– if the weather is clear). It is mostly shady, but be sure to bring sunscreen, plenty of water, a substantial snack, and solid closed shoes. You may also want to consider bringing insect repellant.